Please look after your pets better than these people in Oxted yesterday. Further to yesterday’s photographs here’s a timelapse video showing the passing of time on Limpsfield Chart yesterday afternoon. 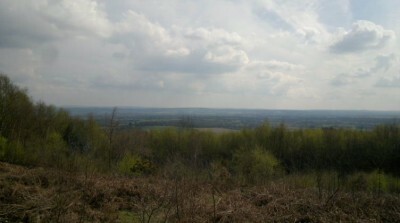 The view this afternoon from Limpsfield Chart. This is a similar view, photographed many years ago. 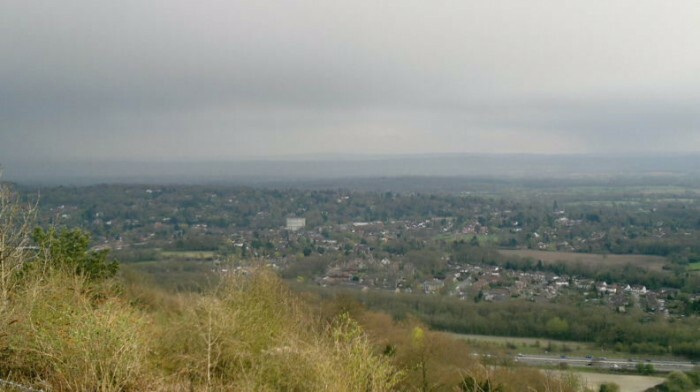 Rain starting to arrive in Oxted from the South East. As seen from the Woldingham viewpoint a few minutes ago. If you were to drop something onto the railway line while boarding your train, such as a spectacle case, do not climb down onto the tracks yourself to retrieve it. Look for one of the station attendants/station master. Generally they have a long tong/pole that can retrieve it for you. If you were to climb on the tracks they would summon the police to arrest you. The fine for climbing onto the railway tracks is up to £1000. Furthermore many lines in the UK are electrified, and even where not, it can be extremely dangerous to tresspass on the rail tracks. In which I practice stitching together bits of video to make a longer composite video. I was filming from a different perspective last night - the top of my helmet. I am not satisfied with the results, mainly because the camera was pointing down a bit much. I need to see if I can adjust that somehow, before moving on (or back) to a different viewpoint. An advantage of having the camera on my head is that there is less vibration from the road/track/bicycle. As I arrived at the start of my ride yesterday, the heavens opened and hail fell. I waited ten minutes and then proceeded in the cool, late spring sunshine. If I had arrived later I would not have realised that there had been rain or hail, although some of the paths (especially in the woods) were a bit muddy. Details of the route: here.